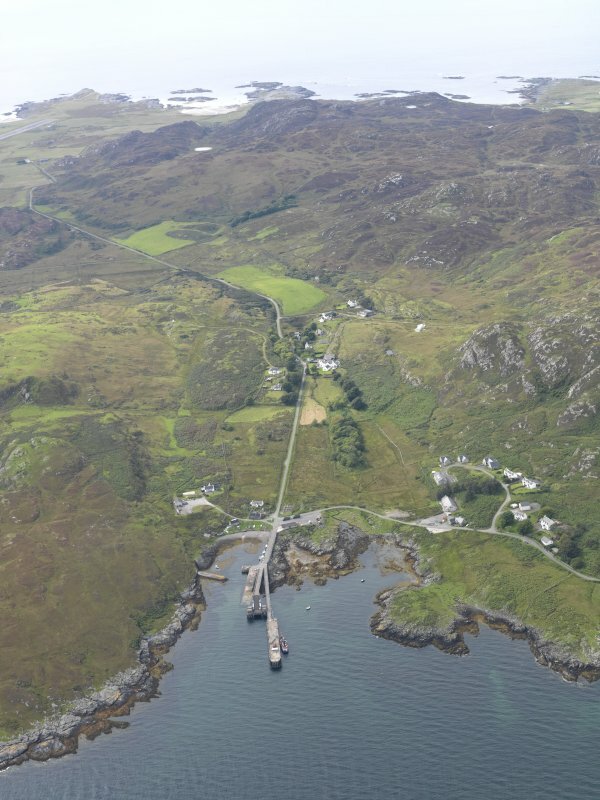 Oblique aerial view of Dun Eibhinn and Scalasaig Farm, taken from the NW. 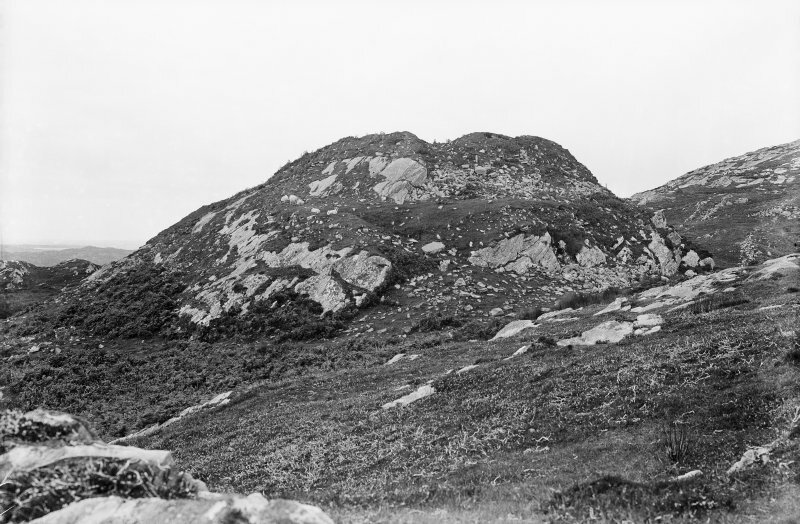 Colonsay, Dun Eibhinn. View looking up towards the fort. 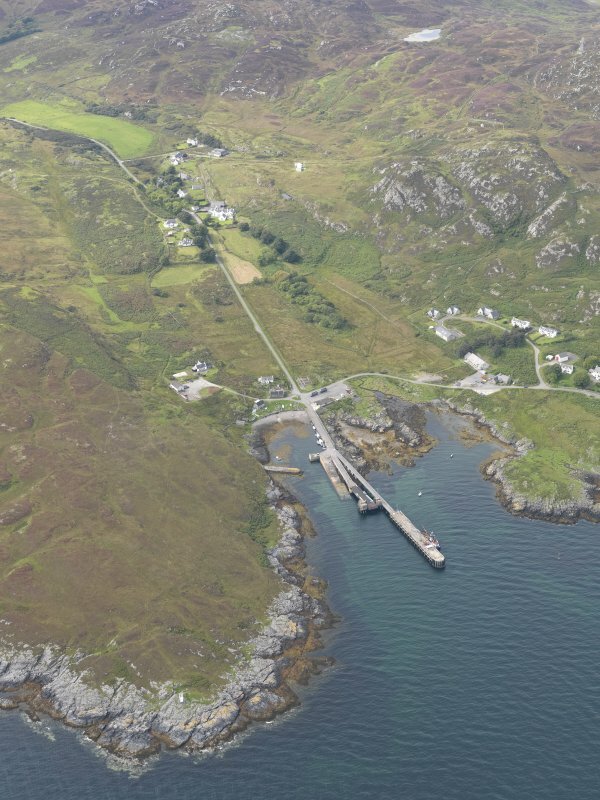 General oblique aerial view of Scalasaig and the pier at Port an Obain, taken from the WNW. Colonsay, Dun Eibhinn. View looking up towards the fort, from the east. 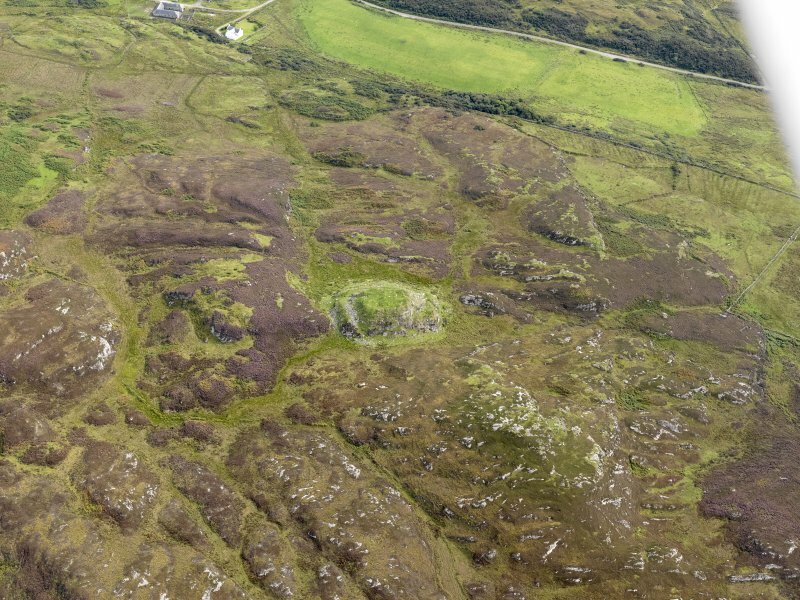 The well-preserved remains of a possibly multi- vallate fort which occupies a high debris-strewn hill rising from boggy land. The ruined, but strongly-built inner wall surrounds the flat top of the hill, on which are traces of huts, and has a narrow entrance in the NE now somewhat altered and robbed. The other walls of the fort (not shown on plan) lie below the crest of the hill and have been heavily robbed for the building of a probably medieval settlement at the foot of the hill. A rectangular depression in the lee of the SW wall of the interior may also be medieval and this may be the explanation for a reference to "the Lord of of Dunevin in Colonsay" on an early 16th century tombstone on Iona. 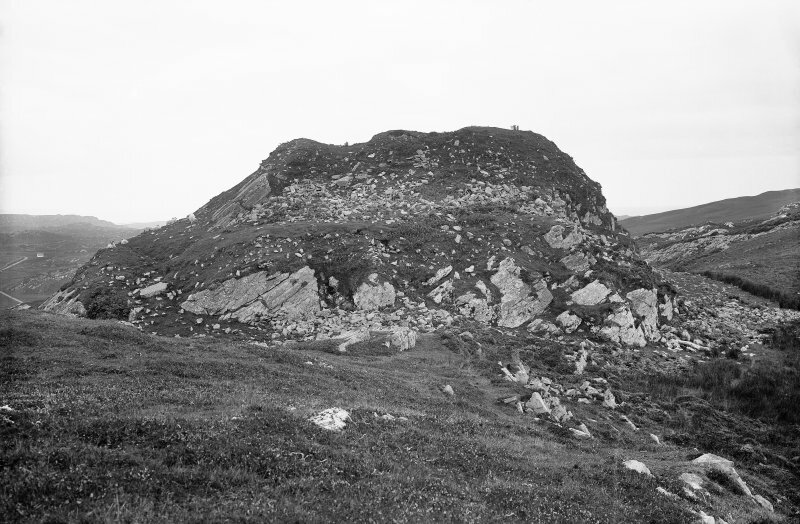 The name is given as Dun Evan by Grieve, but as Dun Eibhinn (with or without the accent) by the other authorities, Loder explaining it as "The Fort of Eyvind", a Norse personal name. Name Book 1878; S Grieve 1923; J de V Loder 1935; S Piggott and C M Piggott 1948. NR 3822 9440: Dun Eibhinn - a dun measuring 20.0m NE- SW by 18.0m within the grass-covered tumbled remains of a wall which, although having no surviving inner facing stones, must have been as much as 4.0m thick from the evidence of the outer face which is traceable throughout. Three rectangular buildings are visible in the interior and appear to have been built on top of collapsed wall material. The entrance to the dun was clearly in the NE where there is a 2.0m wide gap in the wall and several long stones which may have been associated with a doorway. The later occupation was apparently approached by way of a terrace and entrance on the SE. The suggested outer walls of the dun, around two small terraces well down the slope on the SE side, seem to be later enclosure banks similar to others that occur in the vicinity. There is much evidence later habitation at the foot of the hill where there are overgrown building foundations and field dykes but these cannot be certainly described as medieval. Visited by OS (BS), 9 April 1974.
commands extensive views over the southern part of the island. stone remain in situ, the spread of debris suggests that the wall was at least 4m thick. The entrance, on the NE, has been robbed of almost all its stonework and now survives as a hollow-way into the interior. A depression in the wall-debris on the E side appears to be a modern pathway. the core material appears as a band of rubble about 2m thick. It was entered through a gully at the NE angle. are vestiges of smaller structures of subrectangular plan in the E and NE sectors, while the buildings in the W half are of indeterminate plan. Distributed around the base of the knoll there are the foundations of two oblong buildings within the vicinity of the main NE approach, and a group of at least three small circular or subcircular huts built among the out-cropping rocks in the W sector. 16th-century graveslab at lona which names Malcolm MaeDuffie, 'Lord of Dunevin in Colonsay' (RCAHMS Argyll vol.4). Those in the lower group are probably upland settlements dating from the 18th or 19th centuries. This small fortification is situated on a rocky hillock and measures 20m from NNE to SSW by 18m transversely (0.03ha) within a defence comprising two widely spaced walls, the inner extending round the margin of the summit area, and the outer along the edge of a terrace on the slope below it. The outer is heavily robbed, but short lengths of outer face are visible around its circuit. Substantial portions of the outer face of the inner remain in place, standing up to 0.8m high in six courses, and though no trace of the inner is visible the wall probably measured at least 4m in thickness. The entrance is on the NE and the interior is occupied by at least five rectangular buildings, the best preserved of which measures about 5.6m by 3.2m within a wall 1.6m thick.